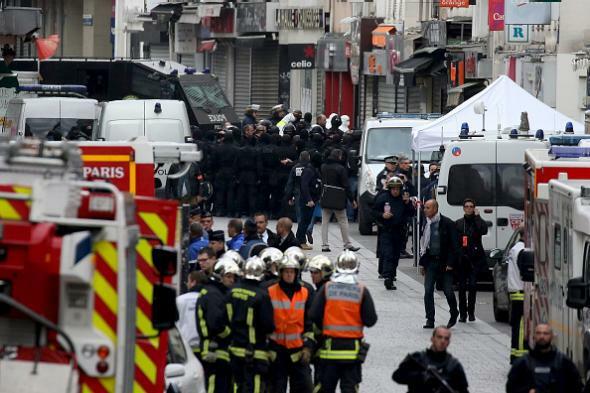 Saint-Denis raid, Paris: New attack said to be thwarted. A photo taken near the site of Wednesday’s raid in Saint-Denis, a northern suburb of Paris. The raid began around 4:15 a.m., when special police forces, backed by truckloads of soldiers, cordoned off an area near the Place Jean Jaurès, a main square in St.-Denis not far from the Stade de France, where three of the seven attackers who died on Friday night blew themselves up. Inside the apartment, on the third floor of a building on the Rue du Corbillon, at least five suspects were holed up. One of them, the woman, opened fire and then killed herself; a man — “another terrorist,” [Parisian prosecutor François] Molins said — died from a combination of gunfire and the detonation of a grenade. The “commune” of Saint-Denis is home to a population of 118,000 including many Muslims.